More and more, people are realizing how valuable young forest is, just as folks gradually came to understand the worth of wetlands and old-growth forest following decades of draining swamps and indiscriminately cutting down trees. 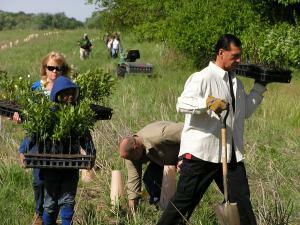 Planting trees and shrubs in fields is one way to create young-forest habitat. But there’s a key difference: Old growth and wetlands tend to be steady-state habitats that don’t need much help from humans beyond being left alone. Young forest, on the other hand, is short-lived: Walk away from it, and in 10 to 20 years that shrubby field or recently logged woodlot will be middle-aged woods, providing many fewer benefits for wildlife. Which means we need to step in and lend a hand. Carefully sited and conducted, clearcut logging can mimic natural events like wildfires or windstorms – while yielding renewable forest products like furniture-grade wood, paper pulp, and wood chips that can be burned to generate electricity. Planting shrubs and trees can turn open fields into wildlife-friendly young forest. The controlled use of fire and vegetation-gobbling machines can remove or chew down older woody growth, periodically returning the habitat to a young stage, insuring that we keep enough young forest around so that the land stays healthy. Shrublands often exist around swampy wetland areas; protecting and renewing such habitats is important for wildlife and also for flood control and water quality. Federal and state conservation agencies, wildlife organizations, land trusts, towns and counties, Native American tribes, universities, the military – along with many private companies and individuals – have signed on to the Young Forest Project. Together we can save our wildlife while preserving a healthy environment for generations to come.